The Guesthouse East is an award-winning Boutique Guesthouse offering stylish Compact Apartments. All individually-designed offering seating areas, separate kitchens and en-suites. 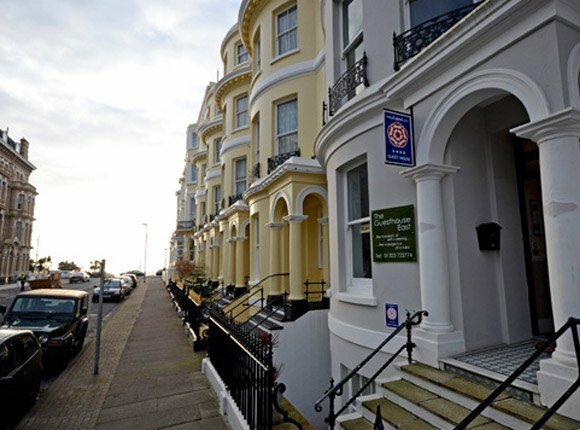 All within an elegant Grade II-listed Regency villa, moments from the sea and Eastbourne’s restaurants, shops and attractions. We’ve thought of everything, including the kitchen sink. This is what makes our B&B unique. Each of our six suites has a separate kitchen. OK we have two of our own, so we kind of have to like children, but genuinely we do! We pride ourselves on being family friendly and ALL of our rooms can easily fit in a cot. With baby kit galore, we’ll reduce your packing. Book ahead for babysitting and enjoy a well-deserved night out. Kick-start your day with one of our delicious breakfasts. Enjoy a Sussex Breakfast made with fresh, locally-sourced ingredients, or opt for a lighter bite buffet! All washed down with barista-style coffee or your choice of tea – latte or Rooibos anyone?